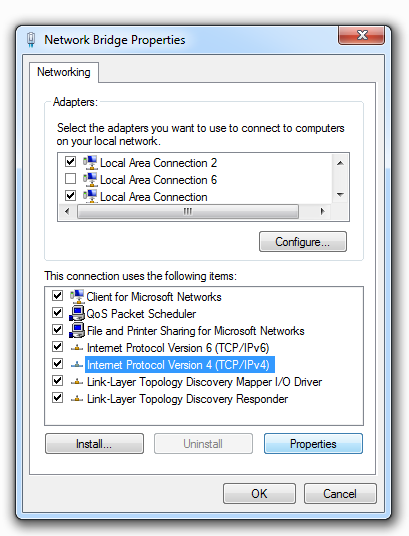 How to use a Windows PC to share multiple network connections? I have a Windows PC (Win 7). It has a couple different network connections, including one that connects to a VPN, and one that connects to the Internet. I want to share both of those connections with other Windows PCs. In other words, on Computer A, I can use the internet (through Connection #1) and my VPN (through Connection #2). How can I do the same thing (access the internet & VPN) on other computers (by somehow going through Computer A)? You'd think this wouldn't be hard to do. I've heard of ICS (Internet Connection Sharing), but that only seems to be able to share 1 network connection. Enable Internet Connection Sharing and select the bridge as the thing you want to share. EXPLANATION: Bridging is what switches do. 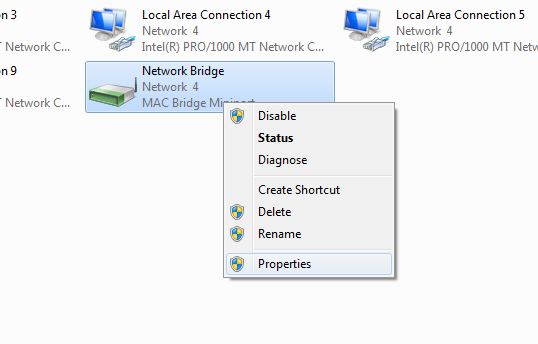 This makes Windows act like a switch, passing traffic between the bridged connections. ICS makes Windows act like a router so you are routing packets to your virtual switch. If you do not care about traffic from Network 2 reaching Network 3 and vice versa (shown below) you can try this solution. 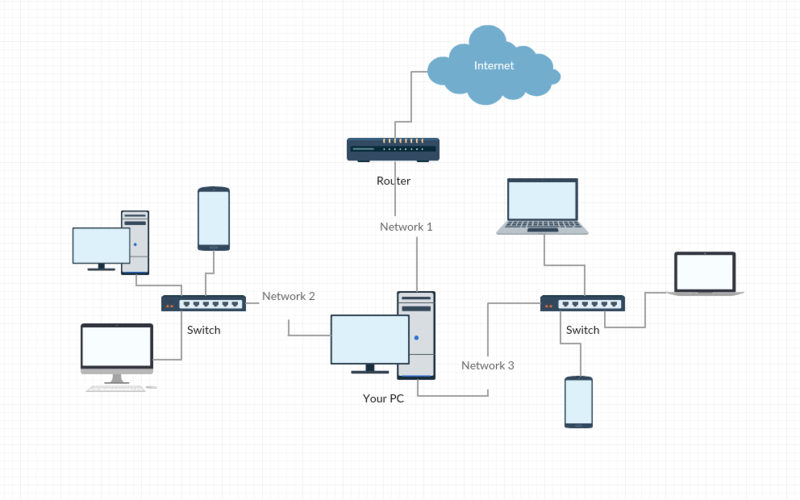 Select the three network interfaces you want to connect, click with your right mouse button and select Bridge Connections. You should see another adapter appear named Network Bridge. Right click this device and select Properties to configure it. Select Internet Protocol Version 4 (or six depending on your preference). Double click that or select Properties. Switch to tab Alternate Configuration and enter your data depending on your setup. The most important is that you enter the correct Default Gateway, because that is the "door" your network traffic needs to reach the internet. The IP address you need to enter there is most likely the same IP your router has. If you're unsure about your DNS Servers it (again) is most likely your routers IP address. 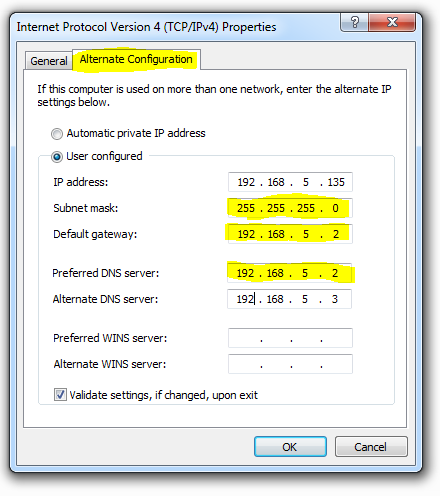 You should not have to enter a IP address for yourself (or Subnet mask) but you can. If you don't know your routers IP address or gateway etc. you can find that out by opening a command prompt (cmd) and entering ipconfig /all. Click OK and test your setup. Not the answer you're looking for? Browse other questions tagged windows networking vpn routing connection-sharing or ask your own question. How to share 2 Internet connections (1 main + 1 failover) to one network? How would I use HTTP proxies and virtual network interfaces with multiple VPN connections? Windows 7 Internet Connection Sharing to VPN - Any way “guest” network can access the “host” network?